I’ve often heard that some styles always come back around eventually. I can see why that would be true with this beautiful scoot from Patrick Tozzi. 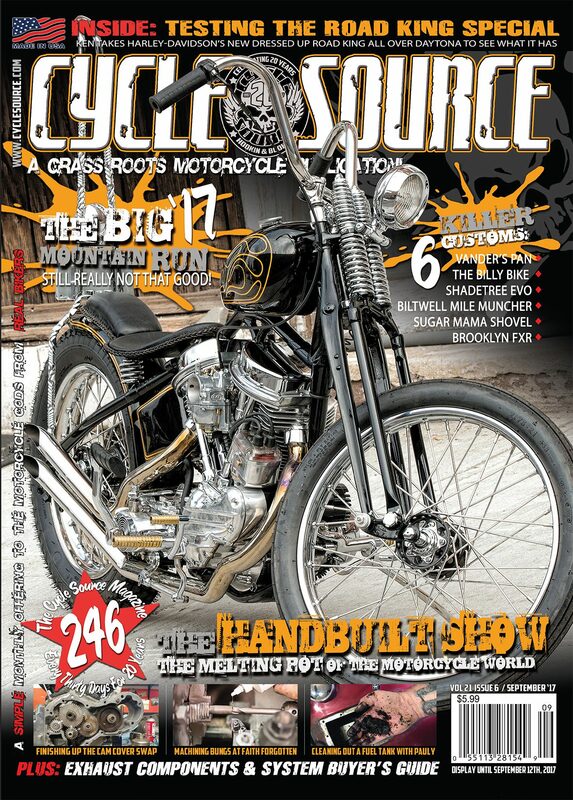 You see, back in the 70’s more than a few bikers took a chance, and instead of using a rigid frame platform for their custom build they used a swingarm frame. Harley- Davidson produced the classic four-speed swingarm frame from 1958 to 1984 with some models even coming off of the production line in 1985. During that time, there were subtle changes to adapt to the Motor Company’s ever-evolving lineup, everything from electric starters to disc brakes affected the design. This frame has long been a builder’s solution to possible hassles from the DMV involving custom made or aftermarket frames. I’ve seen some guy’s change up their bike to a Super Glide style for a riding season and then tear it down and build an FLH type complete with bags and a windshield for the next. The swing arm has always been THE platform to work with. 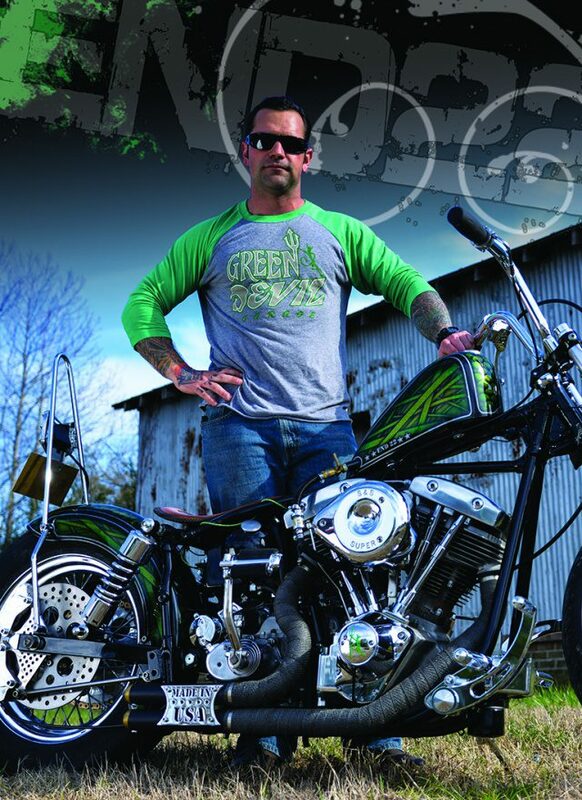 Patrick owns and operates Green Devil Garage. Tozzi knew what he wanted when he picked this bike up. Like most of us, he has always admired any swingarm Harley. He bought the bike from a local guy who had just been cleaning off grease, grime, and some rust when Patrick showed up; didn’t even try to hide the fact because he left all of his cleaning supplies and rags beside the bike. Patrick was a little apprehensive because the guy lived in a known flood area that had recently seen a lot of rainy weather. When he asked the sellher, he assured him that the bike had never been underwater. The motor turned over freely and after a quick glance at the cylinder walls he started to negotiate. Now, he wasn’t expecting the guy’s mother to come out and demand a price that probably could’ve gotten a new Dyna, so he was about to walk away. But as we all know, money talks when you’re ready to walk…so grease, grime and all, a deal was struck. Tozzi ended up with a relatively stock 1977 FXE. He briefly thought about doing a quick turnaround sale but decided to do something a little special. 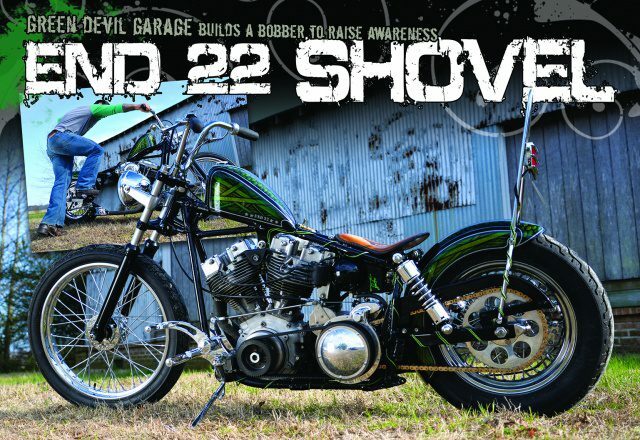 About this time a nonprofit named End 22 approached him about building a raffle bike to help with their fundraising efforts. End 22’s mission is to bring more awareness to the 22 veterans that commit suicide in this country EVERY DAY! Needless to say, Patrick being an active duty veteran with the US Navy was onboard immediately. He knew that he would have to step it up for this build. 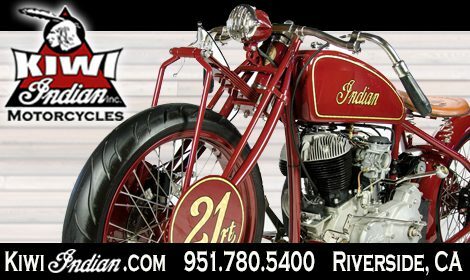 His first move was to reach out to none other than Jeff Cochran of SpeedKing Racing for one of his signature dual rear brake setups as well as a rear fender and frame drop seat kit. He didn’t want the stock battery and oil tank components, so he turned to Curt from Anything Goes 74 for that sweet oil tank. Trying to use as many parts from the original bike as possible, he ended up turning down the legs on the 35mm front end and going with a late model front wheel minus the brake. For that be for to do the job as soon as he showed Jason the colors he wanted and Jason said “Once you get a roller, bring it to me and I’ll figure out what you want!” One of my favorite parts of this bike is the gas tank. Patrick realized he needed a little bit of help with the tank, so he turned to Kyle Yocum of Yocum’s Signature Hot Rods. Yocum generously opened his shop with every kind of metal working tool you can imagine; as well as his expertise to help Patrick turn out one badass tank. Once he had everything on its way he tore the motor down only to realize his worst fears…yep the motor and the transmission had been under water at some point. Not one to be discouraged or pissed off Patrick rolled up his sleeves and did a complete rebuild using all S&S internals as well as the tried and true Super E carb to finish off the motor. The transmission got a complete set of Andrews gears as well as new shafts and seals. All quality components from a couple of great companies that have a long history of producing excellent products! Once final assembly started he used a Tech Cycles open belt drive to tie everything together. Patrick was on deployment when the bike was raffled off but when the winner had an unexpected situation that required some cash, so he stepped up and bought the bike back with the intention of keeping it. However, a good friend in Texas convinced him otherwise so now it rolls along the Texas highways with its proud new owner. I’d like to thank Patrick for his continued service to our great country and for sharing this bike with us!!! 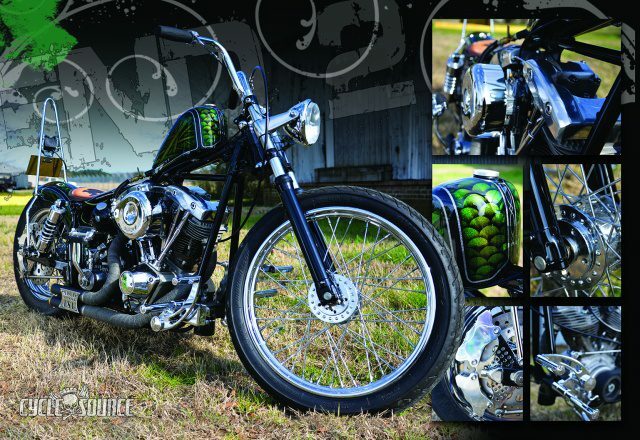 This entry was posted in Feature Bikes and tagged Back Issue, Cycle Source, Cycle Source Magazine, End 22, End 22 Shovel, Feature bike, Green Devil Garage, March 2018, Patrick Tozzi, Shovelhead, Veterans. Bookmark the permalink.